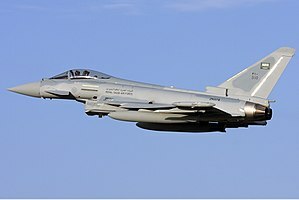 یوروفایتر تایفون (Eurofighter Typhoon)، اوروپادا قورولموش بیر ساواش طیاره‌سی‌دیر. ↑ PICTURE: Eurofighter delivers 500th Typhoon (11 April 2017). آرشیولنیب اصلی نۆسخه‌دن on 11 April 2017. یوْخلانیلیب11 April 2017. ↑ 500th Eurofighter Typhoon delivered (11 April 2017). آرشیولنیب اصلی نۆسخه‌دن on 11 April 2017. یوْخلانیلیب11 April 2017. ↑ 500th Eurofighter Typhoon rolled out in Turin (11 April 2017). آرشیولنیب اصلی نۆسخه‌دن on 11 April 2017. یوْخلانیلیب11 April 2017. ↑ "Management of the Typhoon Project." National Audit Office, United Kingdom, March 2011. بۇ صفحه‌‌ سوْن دفعه ‏۱۱ ژوئن ۲۰۱۷، ‏۱۸:۴۷ تاریخینده دَییشدیریلمیشدیر.